Using examples from his travels abroad of Christians from across the globe who have learned to survive and thrive through the testing of their faith, Dr. Gary Nelson examines how we can develop a resilient faith. Dr. Gary V. Nelson is a published author, dynamic speaker and recognized Christian leader in Canada and around the world. On July 1, 2010, Dr. Nelson began his term as the 12th President and Vice Chancellor of Tyndale University College & Seminary. 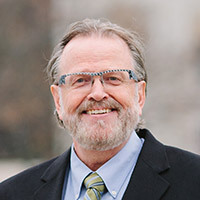 Prior to becoming president of Tyndale, Dr. Nelson served for 10 years as General Secretary of Canadian Baptist Ministries (CBM), the national and global working arm of Canadian Baptists. During those years, CBM experienced striking capacity growth, expanding the organization’s global impact in the areas of leadership development, theological education, sustainable community development and the development of key educational resources for congregations across Canada. As a ministry leader, Dr. Nelson has served in a number of congregations both in staff and senior ministry roles. As Senior Pastor of First Baptist Church (Edmonton, Alberta) in the 1990s, Dr. Nelson was involved in the revitalizing and renewing of this historic downtown congregation into a creative and dynamic contemporary congregation. Since becoming president of Tyndale, Dr. Nelson has nurtured change in positioning the university as a high quality Canadian academic institution. Tyndale prepares women and men for post-graduate studies and careers in business, international development, education, psychology, ministry and more. The world is changing rapidly; cultural shifts in a complex world mean that Christians are facing new challenges as they seek to influence the world for Christ. With this changing global context, Dr. Nelson has faithfully led Tyndale through its own set of unique changes and obstacles. In 2014, Tyndale began major renovations to its 56-acre Bayview campus to equip it with the facilities of a modern university. In the same year, Tyndale celebrated its 120th anniversary as an institution. Tyndale’s rich history is rooted in its ability to meet strategic challenges and societal changes head-on. Dr. Nelson is passionate about leading Tyndale into this unique season of institutional change so that its mission to prepare God’s people to be salt and light can unfold in a world that needs the hope and healing power of the gospel in all its facets.